Queen's Hall, Ely - Ely, Cambs. Look up at the impressive cluster of buildings that rise up to the towering Cathedral behind. 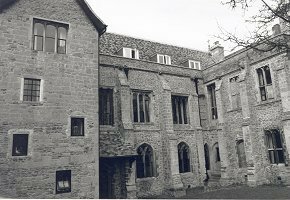 The 14th century Queen's Hall which adjoins the Great Hall, was built by Prior Crauden to entertain Queen Phillipa, wife of Edward 111.